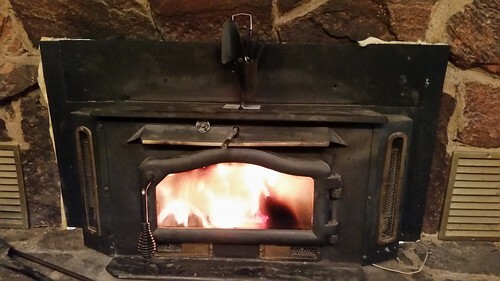 Several days of below-freezing overnight temperatures have exceeded the ability of the small electric heaters to keep the house comfortable, especially given how early in the morning I start work, so it was time to get the fireplace going for the first time this season. Getting the fireplace cleaned annually probably means it draws better, and it was surprisingly easy to get the fire going. Today I have been burning the small branches we trimmed around the property this spring that have been sitting in the sun all summer. Based on the burn rate, that means that in one year we grew enough wood to keep the house warm for one day. Meanwhile, the auto-body shop called me back and said it would take 3 to 5 days to get the windshield for my minivan. I'm certainly glad the vehicle is still usable while I wait for them to get the delivery.